a) that God overlooks our sins. b) that God counts as righteous in His sight the sinner who believes in Jesus. a) a change in us. b) a change in our standing before God. a) the blood of Christ which was shed for us. b) God's pity for us as poor sinners. 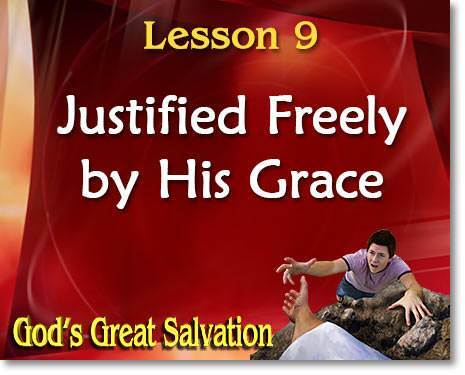 a) freely by God's grace through the redemption that is in Christ Jesus. b) by sincerely trying to keep God's commandments and the church ordinances. a) keeping the Ten Commandments. b) looking forward in faith to the coming Savior. a) to live a good life and treat people right so that we are worthy of being justified. b) to put our faith in Jesus Christ and His blood which was shed for our sins. a) careful attention to God's exact statements of fact in His Word. b) believing strongly in ourselves. a) that Jesus died for sinners and that He is the Savior. b) that Jesus died for my sins and He is my Savior. 9. What kind of people does God justify? a) Ungodly sinners who believe Him concerning Christ. b) Good people who always try to do right.